To get to the root cause of multi-layered issues, IT Operations departments need to match increasing complexity with technology that scales. The ability to conduct root cause analysis (RCA) is confounded by manual coding and endless alerts, both legitimate and noise, forcing IT Ops to adopt a reactive position. 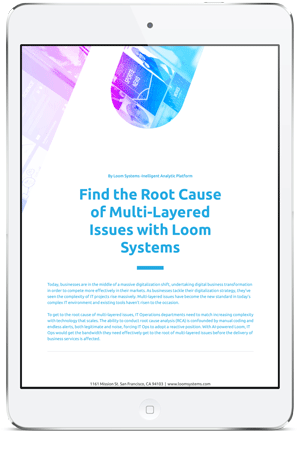 With AI-powered Loom, IT Ops would get the bandwidth they need effectively get to the root of multi-layered issues before the delivery of business services is affected. How a public software and service provider leverages AI to drive its root-cause analysis process.